I can't be the only one that has fruit brought home all bruised from lunch boxes, can I? It seems to be a common thing in my house - and I don't even have kids yet ... just one big kid! If it's bananas that came home it's banana muffins for work the next day. 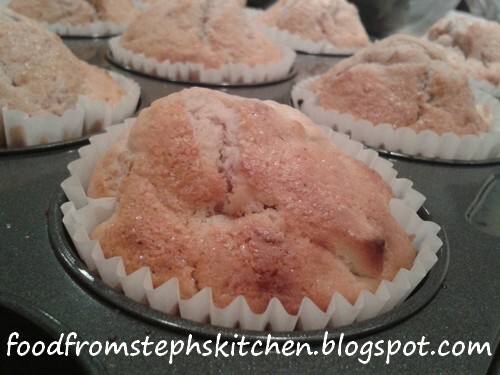 If apples - apple and cinnamon muffins. But there are only so many banana or apple muffins you can make in a week! So with a few apples, a bag of poor almost mashed strawberries, and a few bananas in the fridge after a few days at work I thought I better come up with a better solution than having to make a few different types of muffin. Then I thought - why not just make a muffin with everything ... and then the lunch box muffin was born, and it was delicious!! Firstly, preheat the oven to a moderate (180C) heat. I'm writing this at the top because if you are like me you get to the end and it says "add to a preheated oven" ... and then you have to wait ... which is annoying! In an electric mixer or with electric beaters cream the margarine and sugar, then add the egg and vanilla. Beat the mixture until it is fluffy, until it looks a little bit like cake mixture. Mix through your bananas and strawberries. By slightly mashing the strawberries they give the mixture a slight pink colour from their juice, and by only mashing them a little it adds strawberry bits so that they don't get lost in the mixture. Alternate adding in the flour and milk to the mixture, beating it each time until smooth. Finally, fold in add the apple pieces. In a muffin tray spoon your mixture into muffin cases - making sure you keep in mind that they will grow, so you only want to fill the cases no more than 3/4 full. Before popping them in the oven I sprinkled mine with cinnamon sugar, but it's up to you. Bake in the oven for around 15-20 mins or until golden brown.